Home office with built-in bookshelves. Grand, two-story living room, with incredible beams to match. The curb gives a hint at the same lines, textures and beams from the interior. 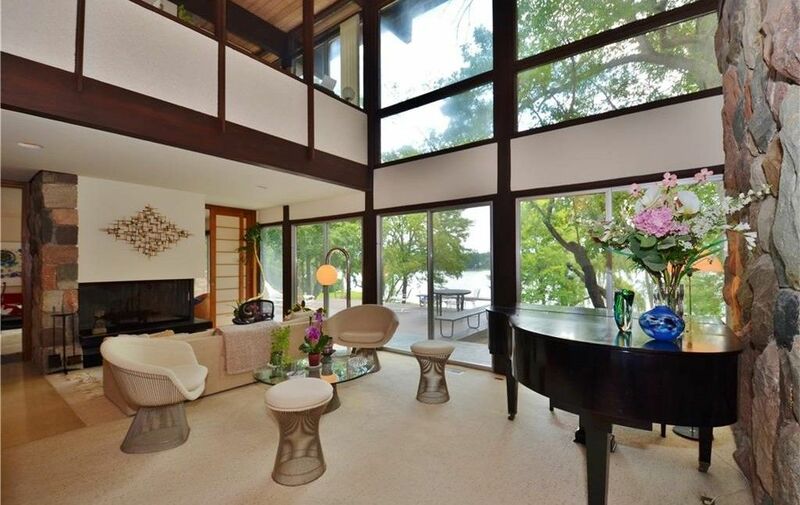 Inspired by Frank Lloyd Wright, the home boats an incredible amount of natural finishes—wood and stone accent the home while further connecting it to the indoor/outdoor lifestyle afford by its location and the incredible number of windows. A focal point of the living room is the floating staircase that turns to carry you up to the second floor—without loosing sight of the lake. 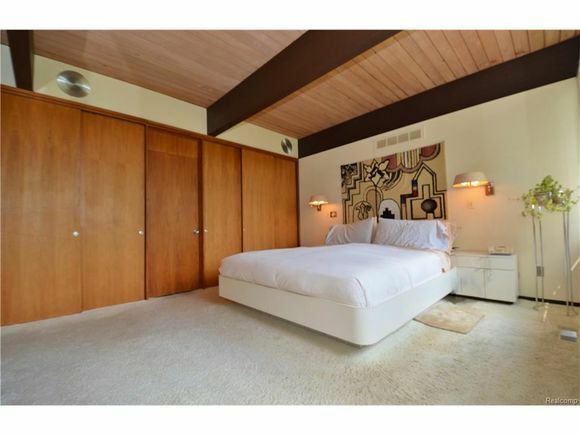 Original features abound—making this home a midcentury purist’s dream home. 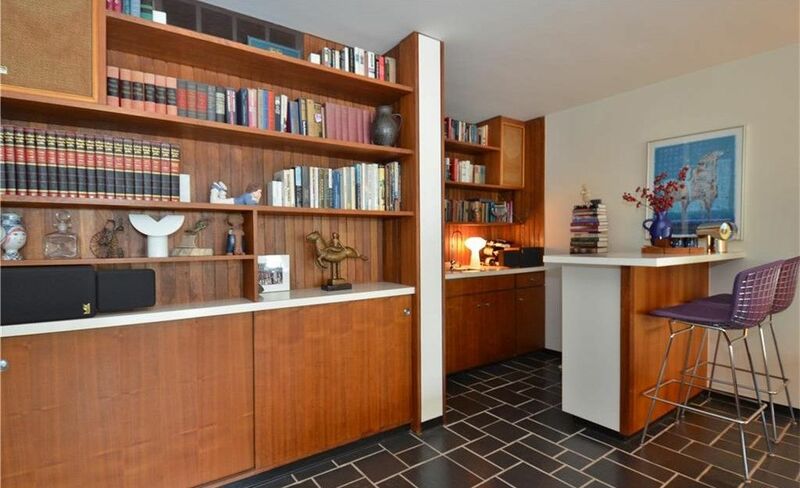 The study has gorgeous book-matched walnut built-ins that include bookcases, cabinets, shelving and a bar area. 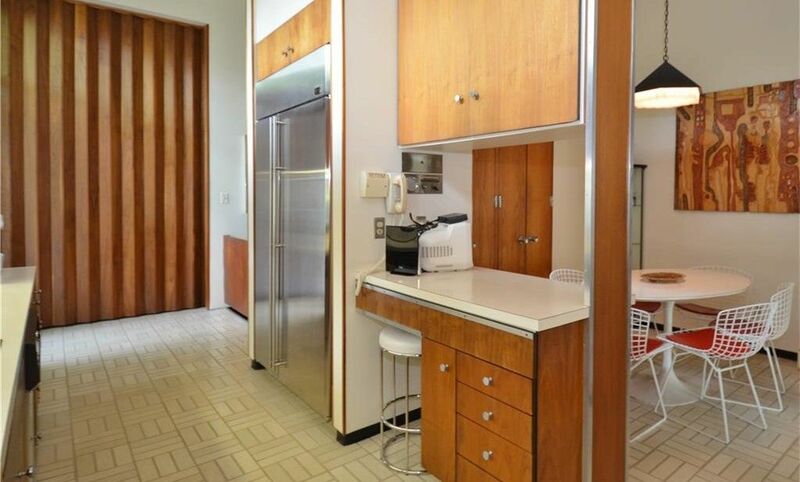 In the large, window-lined kitchen, the original cabinets appear to be in beautiful condition. The kitchen also includes a built-in desk area and a breakfast area. If you look closely, a pass-through can be spotted in the dining room. Even the bathrooms retain much of their original charm. While the pink tile bathroom has an updated countertop, the cabinetry and fixtures in it and the blue tile bathroom appear to be in great shape. 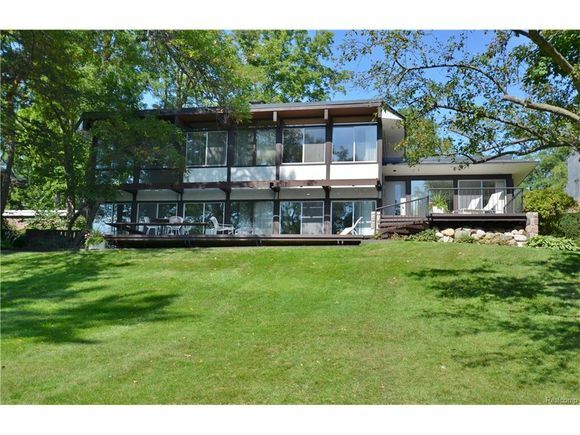 Beyond the two-tire deck and large backyard is a private beach, giving the lucky owner access to Wing Lake. The living room, master bedroom, study, family room, and a second bedroom all have lake views thanks to incredible two-story windows. That same second bedroom also has direct access to the top tier of the deck. The two stories of the home are in full view at the rear of the house. A multitude of wood grains give this bedroom a soft, natural appeal. 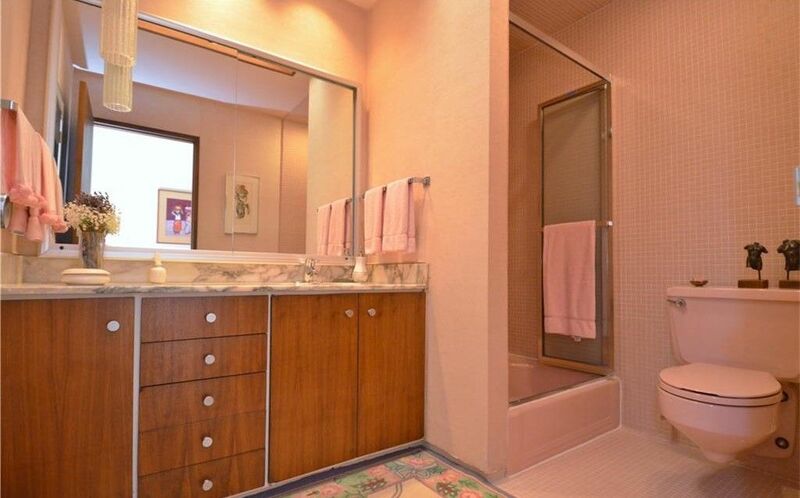 Pink and retro, the bathroom is a time capsule. Walnut cabinets and a fantastic layout make this kitchen and breakfast nook a beautiful blast from the past. According to the listing, the home’s price has already been reduced by an incredible $100K. 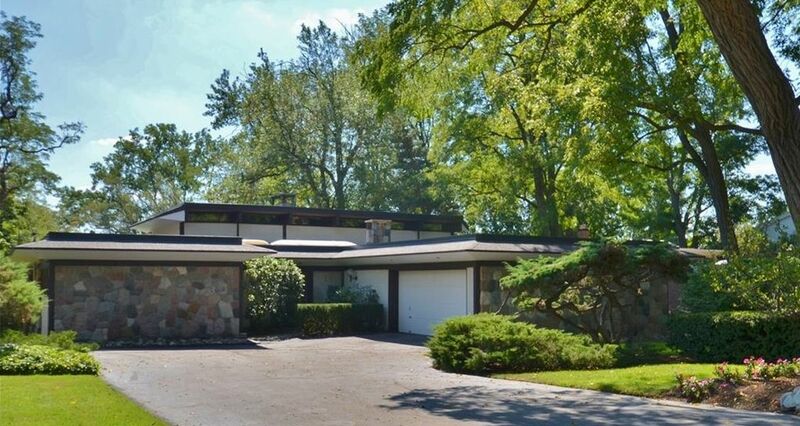 Want to see more pictures, or help preserve this Michigan mid mod beauty by making it your own? 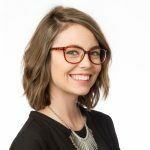 Check out the listing here.